Udupi, June 14, 2015: As per estimated figures in Udupi, more than 10,000 farming families are exclusively dependent on agriculture for their livelihood. Majority are small and marginal land holders with not more than one to one and half hectares. 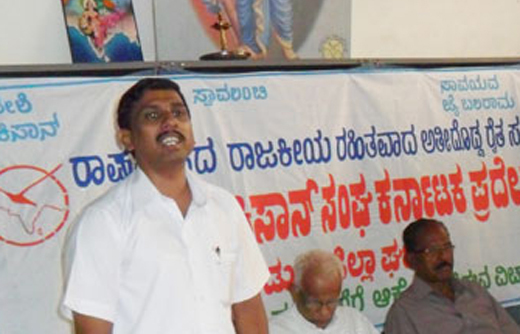 District Bharatiya Kissan Sangha General Secretary Satyanarayana Udupa said the farmers in the district will have tough task if rain is not in full measure soon. The seedlings are ready and the process of transplantation is underway. The farmers here are solely dependent on rain water as there is no irrigation. The monsoon predication and the expected monsoon scenario in the aftermath of cyclone are uncertain. A villager said that profit is least expected and loss of crop in the paddy cultivation has become common. Family occupation of farming has been always given priority. The delay in the monsoons has also delayed the cultivation. Last year the monsoon began by the end of May. Water from external water bodies for the crop growing land preparation has been used. Transplantation process has to be done soon. District Agriculture Department, is all set for better days, as the department plans to harvest at least 45000 hectares of agricultural land during monsoon. However, the total area cultivated through the year includes 52180 hectares of land (kharif -45000, rabi-7000 and summer-180 hectares respectively). Besides, paddy the department has also plans to sow and cultivate 30 hectares of maize, 4670 hectares of pulses, 2120 hectares of oil seeds. The land mass covered under all crops is 59000 hectares. The Joint Director said that the department has sent the indent of 2580 quintal of different varieties of paddy seeds to Karnataka State Seeds Corporation (KSSC). Of which the department has already received 1689 quintal of seeds. About 1337 quintal of paddy seeds would be distributed at the subsidized rates at Rs 10 per kilogram. 3057 farmers are already covered. The subsidy amount is Rs 13.37 lakh. The seeds are available at Raitha Samparka Kendras across the district. The department target for the distribution of various types of fertilizers is set at 10920 tons. Already, 950 tons are given to the farmers. The sowing in the nurseries is started, total rainfall till June 10 is 455.7 mm. The rainfall in the aftermath is 354 mm as against the expected rainfall of 455 mm. according to reliable sources.